Liam is forced to face his worst nightmare, but will he make the right decision? Michael puts his plan into action to prove to Janine that she is not a good mother. Kane’s at the kitchen table. As Liam runs for the door, Kane presses Liam with thoughts of loyalty to the gang… In the café, Bianca comforts Carol she’s seen Liam with Masood. Kat confesses to Carol she’s only stayed because Tommy loves Alfie…Bianca draws the contrast to Ricky. 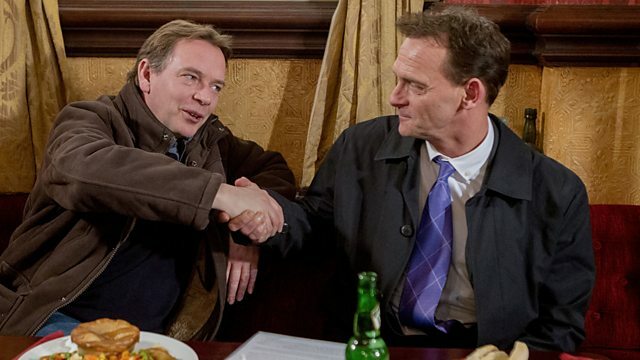 In the house, Kane demands Liam go with the gang to withdraw his police statement and take the blame. Kane says he’ll stay to deal with Tiffany and Bianca. Liam snaps, disowning the gang, but Kane has a knife. Liam runs to the door, losing the key. Kane grabs him, ready to do damage when the door opens. Bianca shrieks and flies at Kane. Masood and the window repair man pin Kane down. Carol calls the police, who take Kane away. Making her decision, Bianca calls Ricky. Bags packed, Liam reassures her it’s only a holiday. She watches him leave, heartbroken but relieved they’ve won against the gang. Janine’s left Billy in charge, who flaunts his responsibility over Ian come to see Janine. Billy plays Ian along but the business responsibilities lie with Janine. At Booty, Kirsty’s livid. She packs Max’s bag telling him to decide between her and Tanya. He leaves. Kirsty rushes after, finding him at 47b. She’s stunned when Max hands her the keys – the flat’s hers. Next door, Ava’s not so chuffed. Abi arranges a surprise party to celebrate Jay finishing community service. Lauren promises Joey she won’t drink but Lucy spikes her drink with vodka. Drunk, Lauren jokes about Heather Trott. The group leave. Lucy watches in the background triumphant as Joey tells Lauren they’re finished.